Therapeutic exercise programs are developed on an individual basis. They are tailored to your pet’s condition or status of surgical recovery, as well as age, overall body condition before and after surgery, and stage of healing. A wide range of aids are used to carry out the specialized plans. It may be as simple as your vet’s hands and dog treats. More complex equipment might include physioballs, balance boards, steps and cushions, cavaletti rails and weave poles. The main goals of therapeutic exercise are increased movement, function and strength, improved endurance and coordination, and better flexibility. With proper guidance, many owners can learn to facilitate these exercises at home. 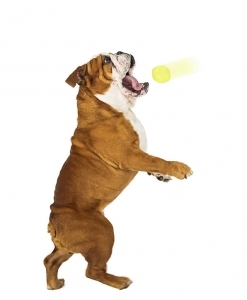 Our exercises start slowly, gradually building strength and endurance, depending on your pet’s needs. For some, this involves the re-training to normal function after an orthopedic surgery. For others, its helping pets learn to walk again after a ruptured disc.